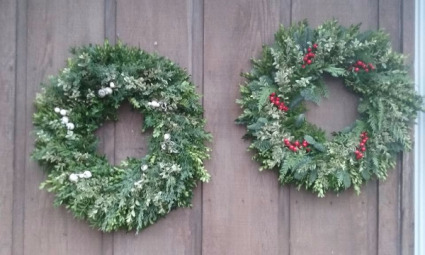 We make all of our wreathes by hand at our shop! We use a variety of fresh evergreens: Taxus, Boxwood, Oregonia, Blue Berried Juniper, Cedar, Noble & Silver Fir and a variety of local pines. We have a variety of berries, pine cones, and other decorations to add. We also make red velvet and Christmas printed bows by hand for the wreathes! They come in a variety of sizes, with infinite design possibilities, call us today! 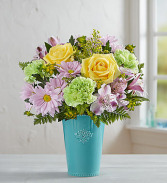 1-800-Flowers EXCLUSIVE Our Garden Sensation bouquet will brighten someone’s day with its sweet pastel colors. Bunches of yellow, lime-green and lavender blooms are loosely arranged inside our keepsake glazed aquamarine vase, inspired by handcrafted antiques. This striking vase flaunts an acanthus-leaf motif and scalloped edge trim with beaded detail, creating a charming-meets-chic centerpiece for any special gathering. The FTD® Sweet Talk™ Bouquet blushes with a vintage style and grace that your special recipient will adore! 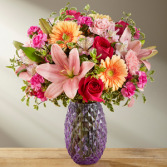 Pink Asiatic Lilies, hot pink roses, peach gerbera daisies, pink Peruvian Lilies, pink carnations, lavender mini carnations, and lush greens are brought together with an artist's eye, making you look at this fresh flower bouquet again and again. Presented in a lavender glass vase with a textured diamond pattern throughout to give it a throwback feel with a modern styling, this gorgeous springtime bouquet is a wonderful way to express your warmest thank you, Mother's Day, Easter, or happy birthday wishes.